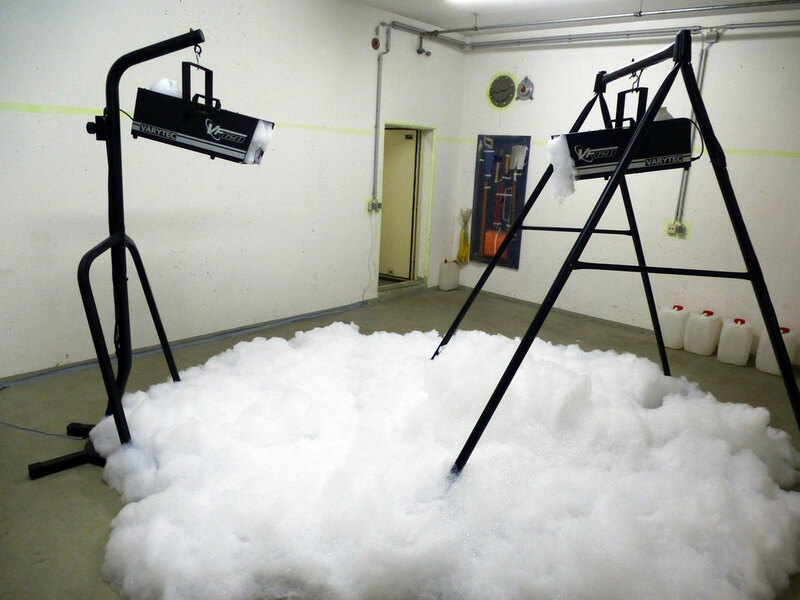 A foam machine is hanging on a box frame, another one on a swing set. Together they look like creatures communicating with each other. Noisy big masses of foam are coming out. The question arises whether they are really communicating with each other or fighting against each other, like two swashbuckler. The foam machines stands for parties and fun, the swing set for playing and the box frame for training. So why are they placed in an emergency room here? The German Philosopher Peter Sloterdijk calls the 21 . Century the „Century of Foam“. 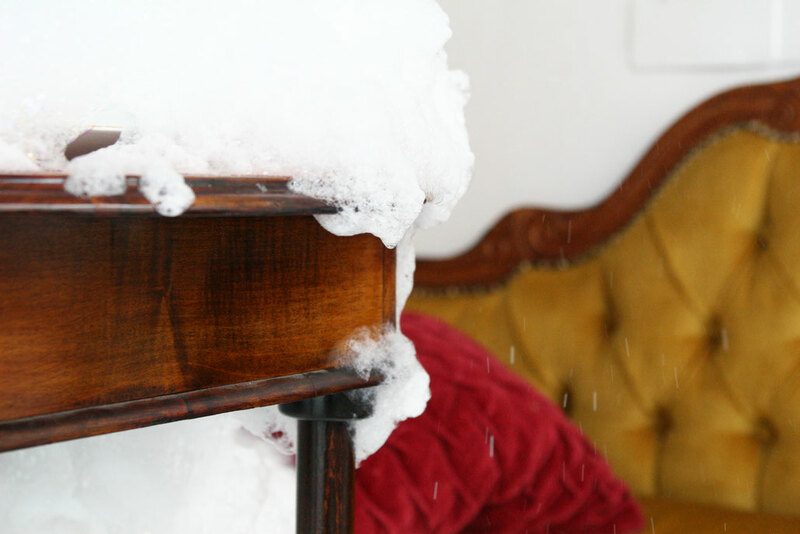 Is foam now an allegory for the world we live in nowadays? Indeed we are living in very ephemeral fluid times. Bubbles come and go. Through this installation seems like a play, it is also irritating and threatening because of the foam taking much space in the room. Furniture from the Age of Biedermeier (1815- 1845) in Austria is a Symbol for retreat, for security in an otherwise insecure future- the evolution of the bourgeois culture in Austria. The rising foam let us think about growing and flowing but also bursting and passing. When the bubbles burst, our comfort vanishes and social and economical fleetingness are the only constants in our fast growing time. 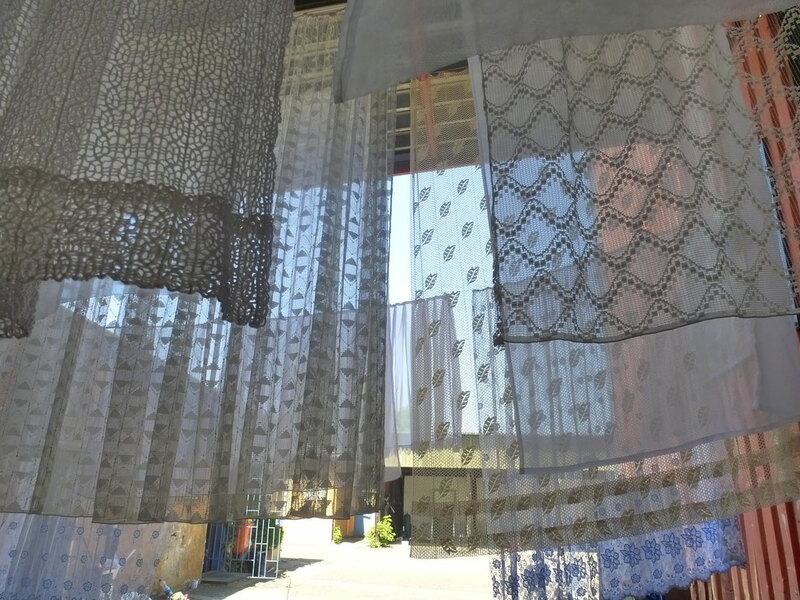 are hanging 30 transparent curtains on clothelines out from diffent materials and with different patterns. It reminds of fresh laundry. Usualy curtains were placed at the window, so that it´s hard to look inside. Here there is no out- or inside. The curtains in a row creates new patterns and impressions. The viewer is also actor, because of moving through this installation and possiple to experience the interaction between light and shadow, transparency, patterns and movement in the open space.